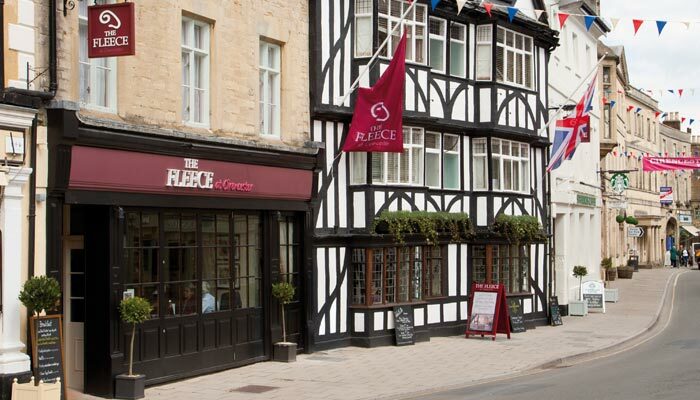 Situated in the heart of Cirencester on the Market Square; The Fleece is the perfect base for exploring Cheltenham, Tetbury and further a-field Oxford, Stratford and Bath. The Fleece is the only AA 5 star inn in Cirencester; offering locally sourced food, real ales and cosy modern rooms. They pride themselves on their award winning food, having won the Best Pub Food at the Taste of Gloucestershire Awards and the Cirencester Chamber of Commerce Award 2013. After a recent refurbishment The Fleece now takes its place as the first Thwaites Inns of Character in the South. The Fleece in Cirencester offers ideal accommodation in the town centre with 28 characterful bedrooms and hosts a number of seasonal events for both locals and visitors. There is limited car parking for guests, charged at £3 per car per night, however there is alternative parking available at the Waterloo Car Park to the rear of the hotel. Visit the Fleece for one of the warmest welcomes in Cirencester.